Polyps overgrowths of the mucosa that frequently accompany chronic rhinosinusitis allergic rhinitis, asthma, aspirin intolerance and other allergies or conditions. The common symptoms are nasal block, sinusitis, anosmia (loss of smell), and secondary infection leading to headache. When you have polyps your nose is clogged and you can only breathe a small amount of air in the nose. Nasal polyp treatment seeks to reduce inflammation and usually starts with drugs, which can make even large polyps shrink or disappear. Drug treatments may include: nasal corticosteroids, oral and injectable corticosteroids (can cause serious side effects). Depending on the underlying conditions other drugs may be prescribed: antihistamines to treat allergies and antibiotics to treat a chronic or recurring infection. If drug treatment doesn't shrink or eliminate nasal polyps your doctor may recommend surgery. The type of surgery depends on the size, number and location of your polyps and the extent of inflammation. Nasodren can help you in case you have viscous mucus stagnation in your sinus. In this case, Nasodren will help to expulse secretions, will reduce nasal obstruction and will lead to pain relief. Nasodren will not shrink the polyps. In case you had to undergo surgery, Nasodren would benefit in promoting healing after surgery and in preventing recurrences. Since Nasodren is a natural product, is efficient and safe. 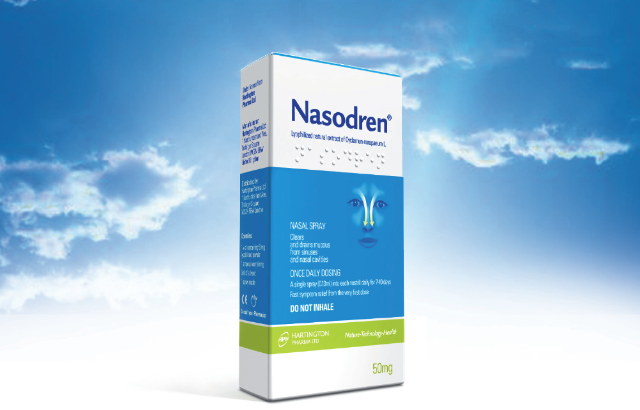 Please, know that if you decide to try Nasodren, the first few times you use it, may produce some itching, sneezing and a brief sensation of mild to moderate burning, These effects are consequence of the mechanism of action of the product and are manifestations of the positive response to the product action. All of these effects usually diminish during the course of treatment.